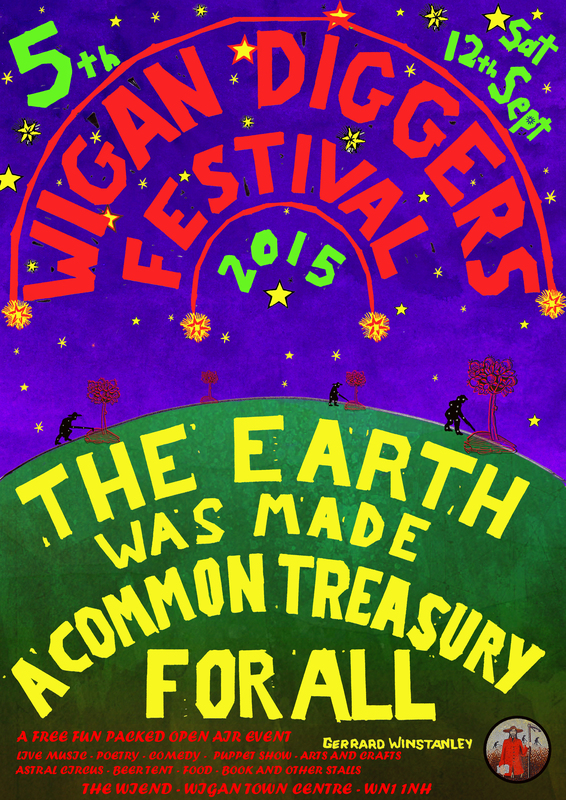 5th Wigan Diggers’ Festival Programme Announced – It’s going to be a cracker! Scene from the stage during Merry Hell’s performance at last year’s Diggers’ Festival. They’re our headline act this year, and on our main stage at 8.30pm. 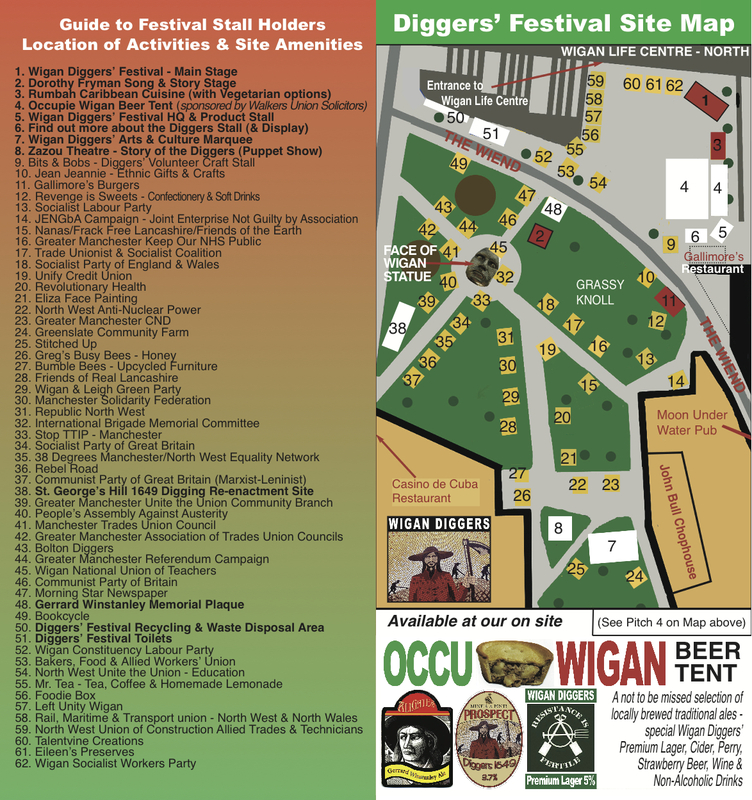 It’s been a year in the making and here it is, this year’s Wigan Diggers’ Festival programme. It’s our fullest day of activies ever, and has something for everyone. 10.30 am – 11.00 am Wigan Parish Church bells will ring, as a prelude to the festival to celebrate the radical Wiganer Gerrard Winstanley who was baptised at the church in 1609, and went on to become the founder, inspirational theorist and spokesperson of the radical ‘True Leveller’ movement, better known as ”The Diggers”, during the 17th century ‘Commonwealth’ period. 11.00 am – 11.15 am – The Wiend – Official unveilling of a new Gerrard Winstanley sandstone mounted plaque to mark Wigan Council’s re-naming of the garden area of our festival site “Gerrard Winstanley Gardens”. 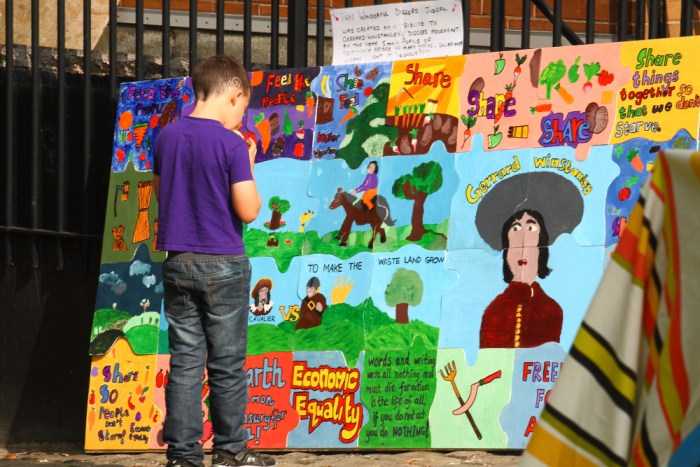 The renaming of the area, is in recognition of the Wigan born radical thinker and activist, whose role in the history of the common people of this country, and for equality and social justice throughout the World, we commemorate each year at our festival. His and the Diggers’ vision of the Earth as “a common treasury for all”, of full equality, and of fellowship, community and love for one another, quite definitely linger on…..and provides us with inspiration and hope, for a better future for all humankind, everywhere. The impressive sandstone mounted plaque, in recognition of Gerrard Winstanley, has been kindly donated by Wigan Councillor Lawrence Hunt, and will be officially unveiled by ex-Wigan TUC Secretary Mike Farley. 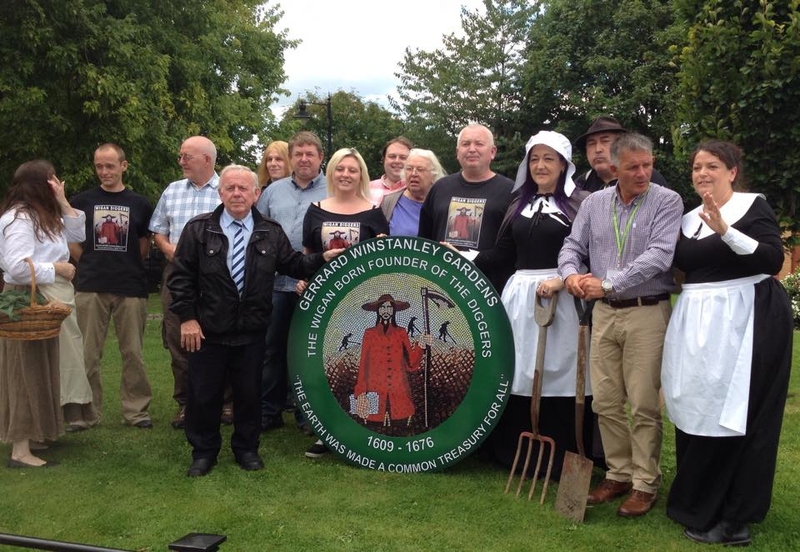 11.15 am – 11.35 am – Diggers’ Festival Town Centre Parade led by Gerrard Winstanley actor Brendan Delaney and members of Wigan Diggers’ Festival Committee (form up on The Wiend for a short walk around town). Scene from last year’s town centre Diggers’ Parade. 11.35 am – 11.55 am – St. Geoge’s Hill 1649 Digging Re-enactment in Gerrard Winstanley Gardens (close to The Face of Wigan statue) during which our guest actor Brendan Delaney will play the role of Gerrard Winstanley, and repeat some of his famous words from April 1649. He will be accompanied by members of the Bolton Clarion Socialist Choir who will lead the singing of Winstanley’s “Diggers’ Song” and “The World Turned Upside Down” by Leon Rosselson, a song which tells the story of The Diggers, made famous by Billy Bragg. 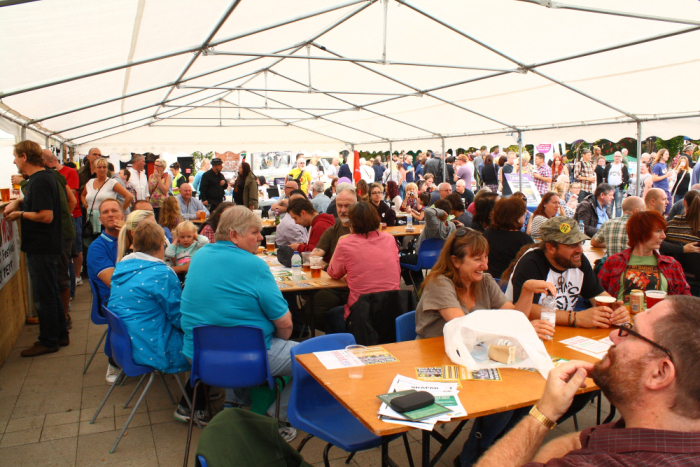 Scene from last year’s ‘Occupie Wigan’ Beer Tent. 12.15 pm to 1.15 pm – In our Arts & Culture Marquee in Gerrard Winstanley Gardens (for age range 8 years plus) – England’s most prolific writer of murder mystery plays Chris Martin, reads from his debut novel. There will be dressing up and much fun to have in solving this case! 12.30 pm to 1.00 pm – At Little Fifteen, Wallgate (approx 150 yards from main festival site opposite the Post Office – over 18s only) – John Winstanley (author of Unsigned & Unscene) will give a talk about who Gerrard Winstanley was, and what inspired him to do what he did with an “An introduction to Winstanley & Radicalism” – Words by John Gurney (RIP) & Derek Winstanley. 1.00 pm to 2.00 pm – At Little Fifteen, Wallgate (opposite the Post Office) – “The Diggers and the English Revolution” a talk by Ian Brooke (who will be dressed for the part). Ian explains the creation of The Diggers in the context of the huge popular revolution that shook England in the 1640s. He outlines the movement of civil disobedience which amounted to a national uprising, that began a train of events, resulting in the overthrow of the monarchy in 1649. 1.05 pm to 1.15 pm – On our MAIN STAGE – 2015 Gerrard Winstanley ‘Spade’ Award presentation to Liverpool screen writer, producer and film maker Jimmy McGovern. Included amongst Jimmy McGovern’s works, are the dramatisation of the 1989 Hillsborough disaster, 1995-98 Liverpool Dockers’ Strike, the events of Bloody Sunday, and a recent BBC film on the controversial Joint Enterprise Law. 1.15 pm to 2.15 pm – In our Arts & Culture Marquee in Gerrard Winstanley Gardens (for age range 10 years plus) – Children’s author Su Ainsworth reads from her debut book “Drabacus” about holiday pals Susan, Dean, Pauline and Michael who are propelled into an adventure when they discover a secret lift in their hotel. Can they solve a 64 year mystery while avoiding a bizarre character and his power which reaches across time? 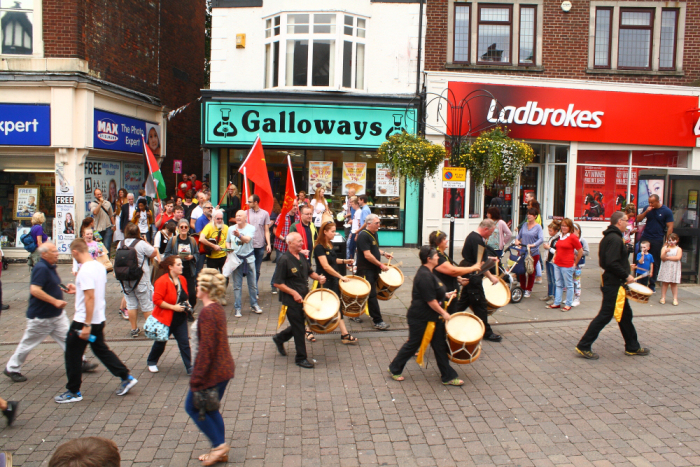 2.00 pm to 2.20 pm – Diggers’ Parade accompanied Greenall’s Brass Band (form up on outside the John Bull Chophouse for a second short walk around town). 2.00 pm to 2.30 pm – At Little Fifteen, Wallgate (opposite the Post Office) – Katharine Ann Angel (author of “Being Forgotten” & “The Froggitt Chain”) will give the first public readings from her new novel “The Burglar’s Baby” “Social responsibilities & the decline in human welfare” and provide personal anecdotes about tutoring excluded youths, fostering teens and housing the disadvantaged. 2.30 pm to 3.45 pm – At Little Fifteen, Wallgate (opposite the Post Office) – Chris Coats & Catriona Stamp present “A Season ticket to the Promised Land” – Based on material from Utopia Britannica & Communes Britannica. Come on a journey from St. Georges Hill in 1649 to Hyde Park in 1969. Meet the Diggers through the ages from Gerrard Winstanley to “King of the Hippes” Sid Rawle. “Win” a Chartist Land Settlement cottage and hear the outcome of Operation Tolstory! WARNING! May include songs, poetry, readings, film clips & FUN! 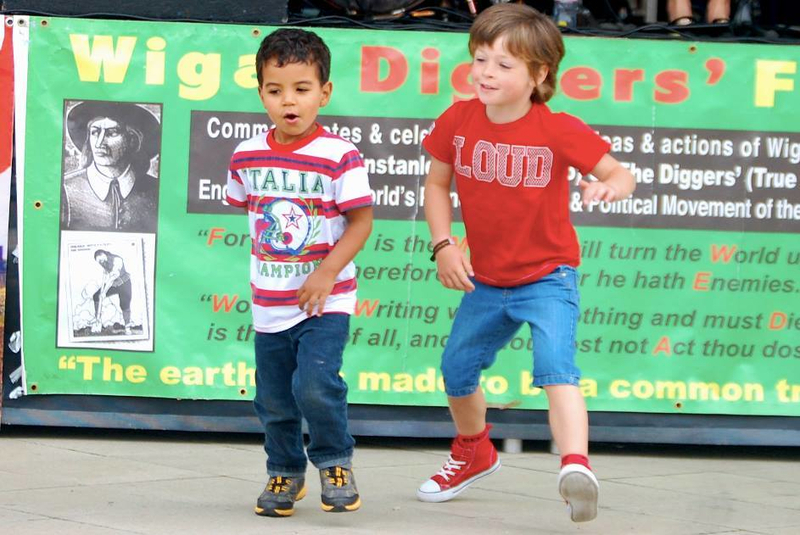 Wigan Diggers’ Festival is a great day out for little Diggers. 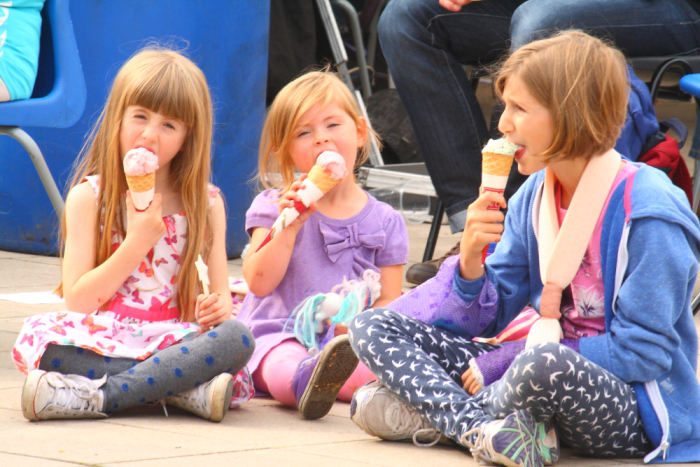 We’ve got a Puppet Show, face painting, balloons, circus performers and lots of other entertaining and educational stuff for kids to get involved with. 3.30 pm to 4.30 pm – In our Arts & Culture Marquee in Gerrard Winstanley Gardens (for age range 6 years plus) – “The Great Snail Race of Toadflax Hall” will come to life as children are invited to colour in pictures from the book while its author Lynne Taylor tells you all about them. 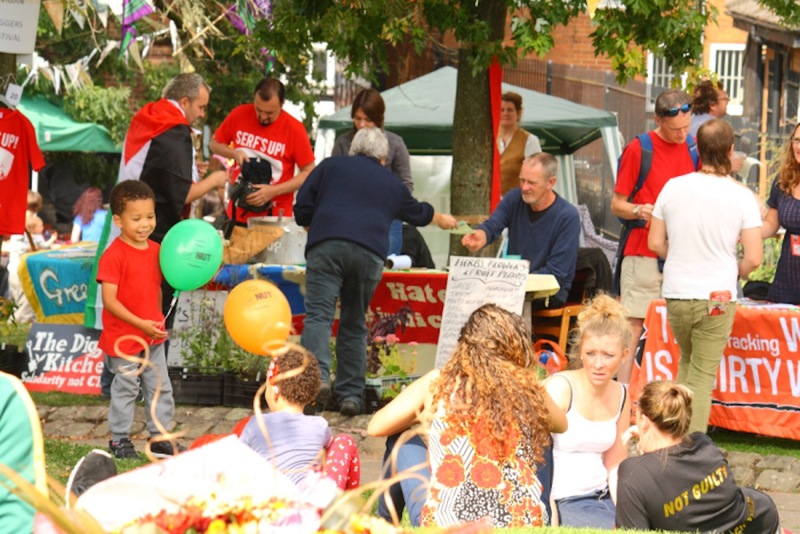 There will be over 50 stalls at this year’s festival – providing hot food, books, arts and craft products, also for our performers merchandise, local credit union, various campaign and community groups, trades unions and political organisations. See this year’s Festival Site Map for full details. 9.30 pm – FESTIVAL ENDS & THE BIG CLEAR UP STARTS. This year’s festival will also play its part in the National Day of Action in solidarity with refugees everywhere, and a banner saying: REFUGEES ARE WELCOME HERE will adorn our MAIN STAGE throughout the festival. A solidarity message from our festival will also be read out at the day of action’s national demonstration in London which concludes at Downing Street. Astral Circus Performers will also be on site to entertain us throughout the day. FESTIVAL SITE MAP & STALL HOLDERS INFORMATION – NOTE: All stallholders are asked to be on site and have your stalls set up by no later than 10.30am on Saturday morning. You are also required to report to our Diggers HQ on arrival, and before setting up your stall . If you haven’t already paid us, you will also be expected to pay us any monies owed BEFORE you set up. CALL OUT for VOLUNTEERS: Although we’ve already got a pretty big team of festival volunteers, WE STILL NEED MORE VOLUNTEERS TO HELP WITH A RANGE OF JOBS – from preparing the site and erecting Gazebos, and regulating vehicle access to the festival site (from 8.00am to 10.30am on Saturday morning), to site stewarding (all day), to waste control, to town centre parade stewarding (between 11.00am and 11.45am, and 1.45pm and 2.30pm) as well as after 6.00pm until 10.00pm behind the bar, serving drinks and clearing up at the end. If you can help out then please e-mail: stevechik@talktalk.net or call 07724 139278 (this number is for volunteers only) and ask for Stephen. Alternatively, visit our Facebook page at https://www.facebook.com/WiganDiggersFestival and click our CALL TO ACTION button, and then follow the instructions. 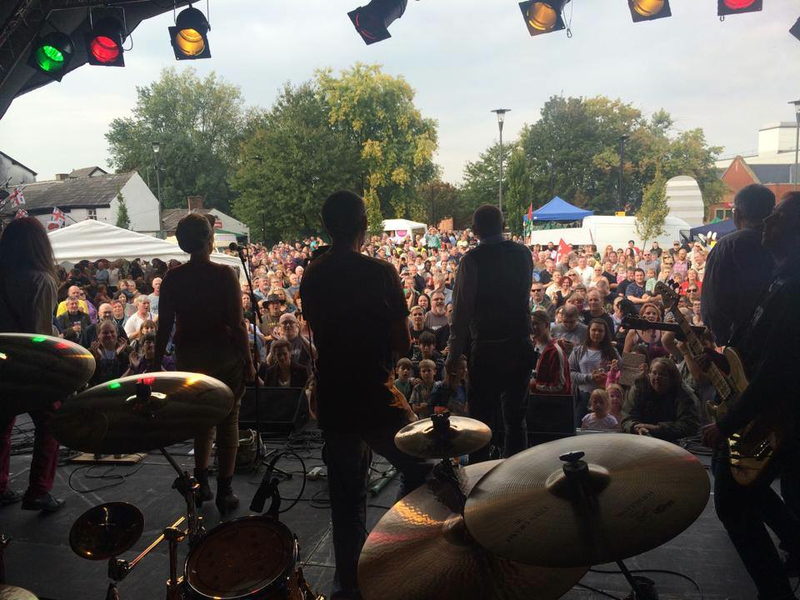 Wigan Band Merry Hell top jam packed Bill at FREE FESTIVAL on 7th September! 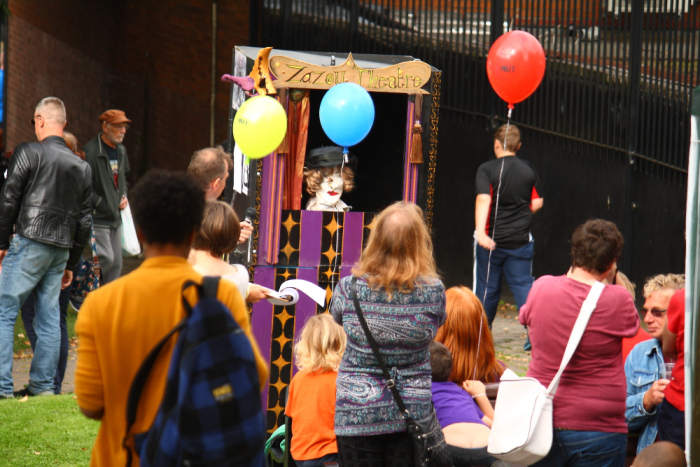 12.45 – 1.00 Diggers’ Puppet Show – Wigan Diggers’ Festival Arts Project Hub area. 10.00 onwards Wigan Diggers’ Festival After Party at The Tudor House Hotel, Newmarket Street, Wigan.